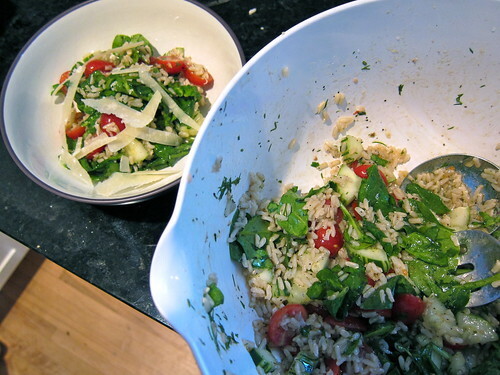 Spinach, Tomatoes, Cucumber, Brown Rice, and a Dill Vinegrette. I spruced it up with a little shaved parm and voila - perfection! So simple, so delicious - and healthy to boot. From Marth Stewart's Everyday Food Magazine (link to recipe). There are lots of crafts going on but they have to stay secret for now. Looks for lots of updates come the first of June. Looks so yummy and healthy. We caved and had pizza tonight.